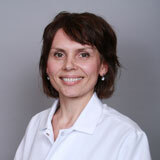 Irina Jones, DDS, has been a practicing dentist since 2005. She provides general dentistry services to patients starting at age 15. Her services include exams, fillings, extractions, bone grafting, crown lengthening, Lumineers, root canal therapy, teeth whitening, and veneers. Dr. Jones earned her Doctor of Dental Surgery degree at New York University. Her undergraduate degree is from Kaunas College in Lithuania. Dr. Jones is a member of the American Dental Association, Academy of General Dentistry, and Florida Dental Association. She is fluent in English, Lithuanian and Russian.